Driving is a piece of cake for this guy. Just take a look at all of the things he can get done while traveling 60 miles per hour on the highway. As data is becoming a medium itself, journalists need to figure out how to tell a story with overwhelming data. This 50 minute documentary explores data visualization as a storytelling medium. The full version with annotations and links is available at datajournalism.stanford.edu. One of the best things about a 45 minute commute each way by train is you can watch some TED videos for inspiration. Here are some of my favorite talks from the series. Temple makes the case that there is a little autism in all of us. Its what makes great minds and needs to be celebrated. What happens when a brain scientist experiences the very thing she has been studying? Jill talks about her experience during a massive stroke which she knows all about. David goes into detail about the great lengths he took pushing his body to the limit of oxygen deprivation. This guy is tough. To help spread awareness to global warming, Lewis swam in the icey waters of the North Pole in nothing but a speedo. Kevin explains how technology evolves like a cell or a meme. Hans has a thick Sweedish accent that you would expect from a great mind. Here he predicts the exact day when India and China will outstrip the US as the economic powerhouse of the world. I marked the date in my Google Calendar. Willard makes incredibly detailed sculptures out of single grains of sand. His patience for his work, which can be inhaled without thinking , is really mind blowing. If only image processing was as easy as it was on TV. Probably the strangest clip I’ve seen in a good while. If this actually aired somewhere, my guess would be Canada… or California public access. Kudos for doing yoga in those tight jeans though. My roommate, Josh, picked up a copy of Wii Sports Resort today and he let me take the first crack at it. Here are my first impressions. Duel – Swing your sword at your opponent and try to knock him off a tall platform American Gladiators style. Pretty fun but too easy. I made it to the Pro status in about 30minutes. Speed Slice – Be the fastest to slice objects in a certain direction. I really liked this mini-game. Requires a lot of focus and quick reactions. Wakeboarding – Try to get big air while being dragged behind a boat. I haven’t figured out how to tweak the tricks but it’s dull. Frisbee Dog – Throw a Frisbee at a target for points similiar to darts and your dog fetches the Frisbee for you. The controls are really hard to get the hang of. Totally doesn’t feel like throwing a Frisbee. Archery – Shoot arrows at a bulls eye. The controls feel just like pulling back on a bow using the nun-chuck. Easy to pick up but difficult to master. 3-Point Contest – Take 3-point shots from various places on the court. The controls are a bit awkward as you have to reach down to grip the ball (holding the B button) then you have to do a tricep extension behind your head to simulate a shot while releasing the B button at the right time. My arm started to ache after the first round. Match – Just like table tennis from the original Wii Sports except you can add spin. It’s not as easy as regular tennis. Golf – Much expanded from the previous version with 3 new courses, 3 classic courses and an option for 3, 9, or 18 holes. Josh is super excited for golf. Standard Game – Exact same thing as bowling from original Wii Sports. Slalom Course – The controls are just like riding a bike and are very responsive. The mini-game itself was ok. There’s not much more to it. Speed Challenge – Paddle around the course as fast as you can. The controls are just like paddling a canoe where you have to keep switching sides in order to go straight. Technically it’s a kayak, not a canoe. Road Race – Try to finish first place in a bike race around WuHu island with different types of terrain. It’s just like the Tour de France. You have to manage your stamina as you can quickly run out of breath from sprinting too much. The controls are just like running in other Wii games. You also have to steer but it’s as simple as leaning left or right while pumping your arms up and down to make you pedal. I can see this mini-game being the most challenging of the bunch. Skydiving – As you’re free falling you have to grab on to other Mii’s and rotate your body so a picture can be taken of you smiling. Points are rewarded for the number of smiles captured on film. At the end you make a formation and have to maneuver through rings. This was fun once but then quickly got boring. Island Flyover – You fly around in an airplane trying to fly through information icons. The format of the mini-game is like a treasure hunt. This concept was a lot of fun. Nintendo should make an entire flight game just like this. It was neat being able to zip around above the island doing barrel roles, and loops for 5-minutes. It’s totally free-form and crashing is kid friendly where the plane bounces. Watching this on a big screen can really make you nauseous. Note: Some sports have other variations that I haven’t unlocked yet, so I left them out of this review. 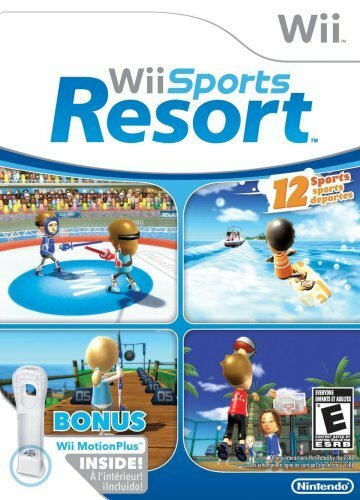 If you were a big fan of the original Wii Sports game, then this will be a no-brainer for you. The new games are fun and most look challenging, especially for parties. My biggest frustration was the 3 minute video Nintendo forced you to watch the first time you played Wii Sports Resort. It was akin to an airplane safety video but instead of talking about features of an airplane designed to save your life, the Nintendo video went into excruciating detail on how to attach the MotionPlus attachment to your Wiimote. Hint: It snaps right into the bottom just like the nun-chuck. The game is $44.95 on Amazon.com and available now. 87 snapshots taken during the design process for the iPhone app Beats. It’s interesting to see something like this come together. It’s not the medium, it’s the content.